Tone-Loc (born Anthony Smith) soared from obscurity into pop stardom in 1989 when his hoarse voice and unmistakable delivery made the song “Wild Thing” (using a sample from Van Halen‘s “Jamie’s Cryin'”) a massive hit. 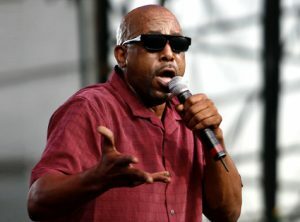 The song was co-written by Marvin Young, better known as Young MC, as was the second single smash, “Funky Cold Medina.” The album Loc-ed After Dark became the second rap release ever to top the pop charts. Tone-Loc expanded his horizons into acting in 1992 and 1993, appearing a few times on the Fox sitcom Roc. He was also in the films Posse and Ace Ventura: Pet Detective, and in 1991 returned to recording with Cool Hand Loc.